Mother Earth Provides Free Fuel! Mini Scout 2 Liter Dragon Pot Only! SilverFire Bag for Hunter Chimney Stove or Super Dragon Stove: Camo. Please select which stove model bag you are purchasing the bag for (bags are different sizes). To Order: Select Add to Cart and proceed to Cart to checkout on top right of page.You never have to create an account to buy from SilverFire! Free Shipping in Continental United States! SilverFire® amazing Hike & Stow Survival bag in color of your choice with new SilverFire Website Logo! This is the best survival stove bag on the planet! You can count on this multi-function bag in emergencies, for recreation, or just to protect your stove. It is an emergency water vessel with a water proof interior liner and all seams are sealed in both the bottom and side walls of bag. It is a combo cooler, or thermal cooker with a middle layer of insulation on bottom, sides, and top! Simply bring your beans or rice to a boil and throw some hay or other insulation on both, sides and top and zip it up! It will continue to cook your food four hours. Insure that you use enough insulation to protect water proof liner. Of course it will also protect your stove, when used as a protective stove storage bag. The exterior ballistic shell is padded & rugged! 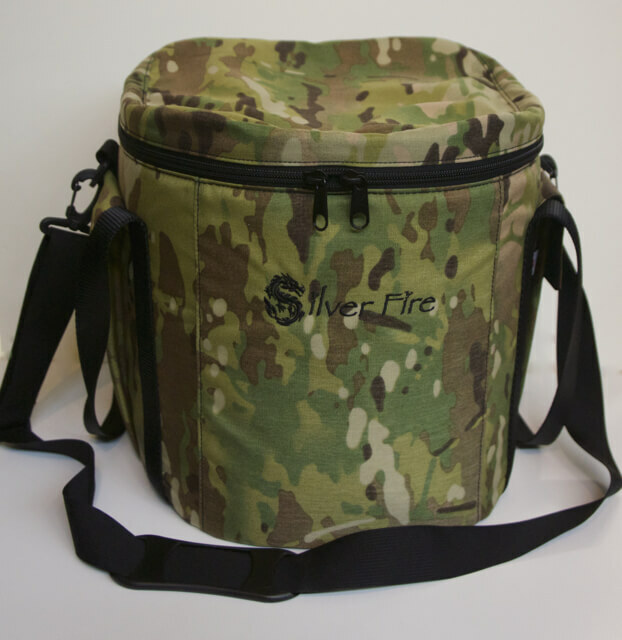 This custom bag was specially designed for all SilverFire® stoves. It is custom made in Oregon! The custom insulation is designed both for for cooking food as a thermal cooker / hay basket*, or you can choose to fill it with ice and use it as a cooler! It can be used as an emergency water vessel to carry water, or use it as a protective storage bag. 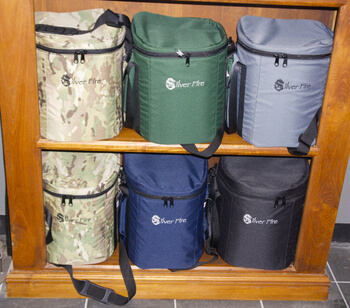 We designed other stove bags and there is no other product like it available anywhere. High end luggage and camera bags do not meet the quality build of the SilverFire Hike & Stow bag. This bag is has two load carrying options. It can be slung across your body on hikes with the heavy-duty shoulder strap and pad, or it can be carried by the dual rugged cargo handle straps. * Thermal cooking is an efficient way to cook using insulation or hay. After pot brought to temperature it can be inserted into a bed of hay inside our stove bag, an insulated bag, or cardboard box for several hours. This insulated form of cooking is know as a poor man's crockpot. It is an effective way to cook and reduce fuel use and emission's in conjunction with using an efficient stove. This technique can also be paired with solar cookers. Efficient stoves, solar cooker, and thermal cookers can all be used efficiently together. This technique is known as integrated cooking and is a great way to cook efficiently while reducing emissions and fuel use for a cleaner air shed. Available in Black, Charcoal, Forest Green, Navy, and Multi Cam Fabric! Special introductory pricing: $99.95 with Free USPS shipping to the Continental United States, at check out. Please call for shipping quote to Alaska, Hawaii, & Puerto Rico for additional USPS shipping fee total. Please call or write for all International shipping quotes. Returned SilverFire products subject to 25% product restocking fee and all shipping costs are non-refundable. Enjoy exploring the largest selection of off-grid cooking products and more! Large packages over 50 lb., require freight quotes. Online shopping cart for Continental USA orders only. AK, HI, PR, & International orders processed manually. Non-Continental USA orders subject to additional postal fees variable by location.